Replaces Dinochews Chewable Multi Vitamin! 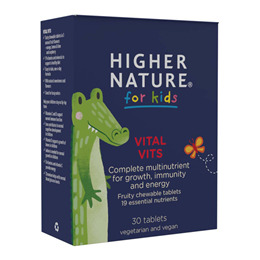 Higher Nature Kids Vital Vits - Chewable MultiVitamins contains 19 essential vitamins and minerals with three delicious fruity flavours (raspberry, lime, mango) in fun-shaped characters. They`re especially great for supporting the daily diet of fussy eaters. Free from artificial sweeteners and preservatives. Easy to take one-a-day formulation. Sorbitol, fructose, natural flavourings: orange, raspberry, mango, lemon, lime; magnesium oxide, ascorbic acid (emulsifier: hypromellose); natural colourings: carotene (emulsifier: acacia gum; sunflower oil, antioxidant: ascorbyl palmitate; antioxidant: dl-alpha tocopherol; anti-caking agent: silicon dioxide); zinc oxide, anti-caking agent: silicion dioxide, beetroot powder (acidity regulator: citric acid); sodium ascorbate, ferric pyrophosphate, nicotinamide (anti-caking agent: silicon dioxide); zinc oxide, anti-caking agent: silicon dioxide); zinc oxide, anti-caking agent: silicon dioxide, anti-caking agent: stearic acid; anti-caking agent: magnesium stearate; d-aplha tocopheryl acid succinate, acidity regulator: malic acid; calcium d-panthothenate, pyridoxine HCI, acidity regulator: citric acid; vitamin A acetate (sucrose, stabiliser: corn starch; emulsifier: acacia gum; antioxidant: dl-alpha tocopherol; anti-caking agent: silicon dioxide); thiamine mononitrate, ergocalciferol (coating: ethycellulose; antioxidant: mixed tocopherols, sweetner, steviol glycosides, manganese sulphate, folic acid, potassium iodide, chromium picolinate, sodium selenite, d-biotin, cyanocobalamin. Contains iron which, if taken in excess, may be harmful to very young children. These tablets are not sweets. 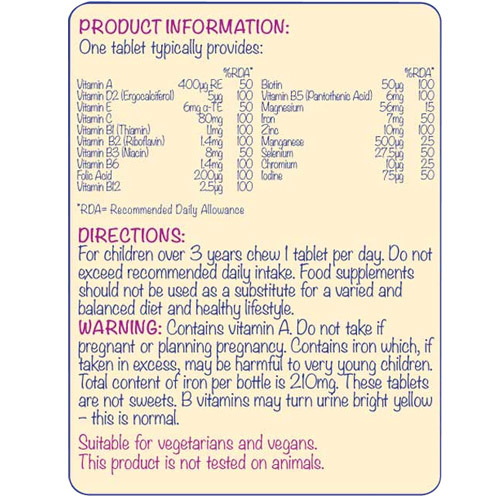 Below are reviews of Kids Vital Vits - Chewable MultiVitamins - 30 Tablets by bodykind customers. If you have tried this product we'd love to hear what you think so please leave a review. 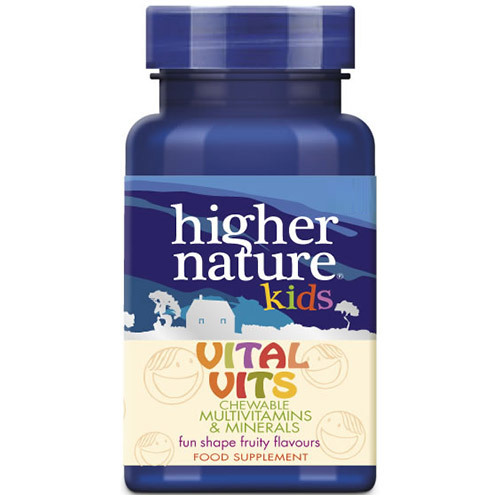 Higher Nature Kids Vital Vits - Chewable MultiVitamins contains 19 essential vitamins and minerals. Three delicious fruity flavours with fun-shaped characters, especially great for fussy eaters to support their daily diet.